petition: Help shut down Grandview Aquarium in a mall in Guangzhou, China! Help shut down Grandview Aquarium in a mall in Guangzhou, China! "The last time CAWA and Vshine visited the facility was in April 17 but we have heard nothing since. They haven&apos;t posted anything on Pizza on their website but we have asked them to do so when they have done their next visit. FYI their websites are in Chinese"
These animals have not only been taken out of their natural habitat, but they are forced to live in prison-like conditions in a gigantic shopping mall. The cages are small, without any natural features, including sunlight! These poor animals like Pizza the polar bear will never see the light of day, never breathe fresh air, never be able to interact according to their nature, and are trapped with no stimuli whatsoever. Many of them die in these horrific conditions, and those that don't are subjected to a life of extreme misery, and all for the sake of profit and entertainment. Animals Asia have been trying to shut down this zoo, but they need our help. Please sign the petition to save Pizza the polar bear and all the other animals. You can read more about their plight here. I am writing to you on behalf of all those who cannot stand by and watch such cruelty to animals as those at Grandview Aquarium in Guangzhou, China. Animals Asia and the China Cetacean Alliance have already been in touch with you in an attempt get the aquarium/zoo in this giant shopping mall closed, but with no success. Please investigate the conditions once more, and take the neccessary actions in order to close down Grandview Aquarium and rehome these poor creatures. I ask you to disregard the claims of Haichang Holdings, China's largest operator of marine parks and the company that runs the aquarium, which stated that "their purpose is to popularize science and nurture marine life". Shutting down Grandview Aquarium in Guangzhou is the only way to give these animals justice and the chance of a life worth living. 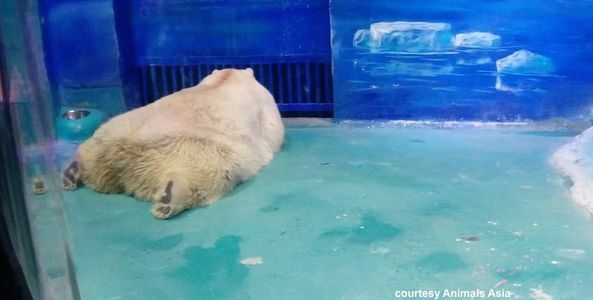 Pizza, the "saddest polar bear in the world," is temporarily being spared his pitiful life and being reunited with his parents at an ocean park. Now, more than ever, we need to convince the authorities to make this a permanent move for Pizza and to start the process to move all the other animals to sanctuaries. Please share the petition with your friends and family to help us get more signatures. Update on petition: the Chinese authorities were contacted about this matter months ago, but I have not received any response whatsoever from them. I have also been in touch with Animals Asia, informing them of my petition results, but - alas - to no avail. If any of you have an idea on how best to proceed from now, then please do not hesitate to let me know.